CoxGomyl’s number one core value is safety and the well-being of everyone involved in building access is central to everything we do. As a global provider of building maintenance units, we are experienced in working under a wide range of climates and weather conditions. What are the key safety considerations for working at height in severe weather? Is working at height allowed in severe weather conditions? The first factor to consider is the local laws and regulations regarding working at height, which can vary widely from one country to the next depending on the general climate. For instance, in some countries working on a roof is prohibited during snowy weather, whereas in countries with a colder climate, working in snowy conditions is accepted as necessary. Make sure you are familiar with the regulations where you are and stay on the right side of the law. How can the weather affect fall protection? The basics of fall protection begin with precautions such as operators wearing a body harness and restraint lanyard which are properly secured to a suitable anchor point. Our cradles provide clearly designated safety harness anchorage points. Depending on your building you might also be using permanent anchorage systems fixed to the roof or personal protective equipment. In colder climates which experience sub-zero temperatures, stainless steel could easily freeze. Anchors designed to rotate can become frozen into one position and integrated energy absorbers can also lose functionality. In this instance, it is vital that no electronic or gas-powered heaters are used to clear the ice. This can damage your equipment and mean a repair or replacement is necessary. Instead, you may be able to manually remove some of the ice so that, for instance, an anchorage eye can rotate properly. The anchor points should then be dried with a towel or cloth to minimise the risk of corrosion. In environments that experience a lot of heavy rain, corrosion of safety equipment can be an issue and regular maintenance is particularly important. It is also advisable to carry out an inspection after a heavy rain storm, checking for things like loose branches and other debris that might affect the safe use of the system. Clearing debris or grime using a high pressure cleaner on building access safety equipment might be too powerful and can cause damage. As with ice and snow, manual cleaning and drying may be the best option. In many parts of the world the weather conditions affecting safety are the opposite of ice and rain: sunlight and extreme heat. High temperatures can affect the form and strength of all types of metals, including fall protection anchor points. When exposed to high temperatures for a longer period of time, metal parts can expand and possibly warp. Again, regular maintenance by well-qualified technicians can offer peace of mind that the safety of your people is protected. Personal Protective Equipment, such as a safety harness, is often stored by the user, which decreases the risk of damage by exposure to extreme weather. It can, however become wet due to snow or rainfall during work. In this instance, you should never try the ‘quick fix’ of drying a fall protection harness with a heater, which can melt the webbing and weaken the harness. Once the harness has dried out, always complete the usual pre-use checks. Permanently installed fall protection equipment is not always accessible from outside a potentially hazardous environment, but users should, as far as possible, carry out a visual check from the safe zone before entering the work area looking for any signs of wear, damage or corrosion. Once you have attached your lanyard to the anchor point on the BMU or the building itself, you can continue to check for any damage that was not visible from further away. 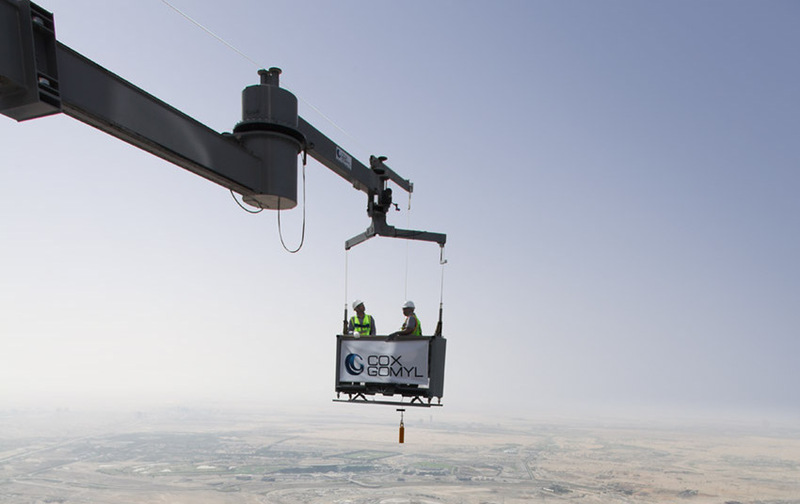 For complete peace of mind on the safety of your people and the condition of your building access system, CoxGomyl offer a full range of maintenance services for all of our BMU products.